Flambards Theme Park is one of Cornwall's best family attraction with fun rides and entertainment for everyone to enjoy. There are also the award-winning exhibitions including the unique Victorian Village and the Britain in the Blitz. There is so much to do see and do at Flambards ,Whatever your age or interests. You will be sure to find something for everyone. 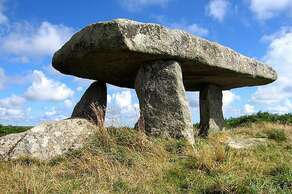 Lanyon Quoit is a dolmen in Cornwall, two miles southeast of Morvah. In 1769 William Borlase described the megalithic site for the first time in a publication, illustrated with etchings in which the Lanyon Quoit's design and floor plan has a different look from today, Lanyon Quoit collapsed in a storm in 1815 and was re-erected in 1824. Skippered by Adrian Thomas, Mermaid pleasure Trips is a family run business which offers coastal cruises &Fishing Trips out of the Historic port of Penzance onboard the Mermaid II, which is a 33ft long Cygnus Cyfish with a top speed of about 18 knots. With over 630 miles of stunning scenery. The South west coast path's National Trail has been rated as one of the best walks to be found anywhere in the world according to Lonely Planet. It was also voted as Britain best walking route by the readers of walk magazine. The origin of St Ives is attributed in legend to the arrival of the Irish Saint la of Cornwall, in the 5th century. 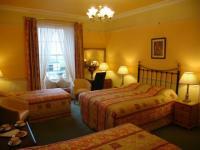 It Has one of the oldest inns in Cornwall and is renowned for its artists. The Sloop inn which lies on the wharf was a fisherman's pub for many centuries, It has been dated to around 1312. 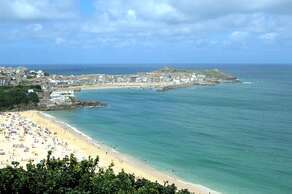 St Ives was Incorporated by the Royal Charter, In 1639 and is a great place for a day out. Rock Climbing and Sea Kayaking, Get a unique view of the west Cornwall coast line from its Soaring granite cliffs to its wide variety of wildlife and secluded sandy beaches. These will be just some of the things you will experience, on what should be a fantastic adventure. The Canoe Club offers Paddle Sport activity for all ages &abilities. They run a beginners courses throughout the season as well as Sea Kayak excursions, River Paddles, Kayak Surfing and Social Paddling in and around Penzance Harbour. 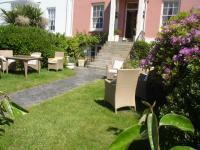 The Sailing club is located on the edge of Mounts Bay and is situated on some of the best sailing waters in the UK. The award winning Sennen Surfing centre is one of the longest running surf schools in the UK, Situated right on the golden sands of Sennen beach. They have a fully qualified experienced and friendly team which offer a variety of surfing courses for all abilities. Sea Cornwall offers a range of sea kayaking courses and expedition to suit all levels. Hire a Bike and enjoy the fresh air and all the fantastic places to go and see in Penzance and the surrounding area of west Cornwall. The Acorn is a vibrant creative centre for, live arts for all of West Cornwall. It has a reputation for innovative and occasionally quirky programming and for over 40 years, has hosted a huge variety of acts, groups and projects Including theatre, Dance, Music, comedy, children's theatre, films and choirs, and has great facilities and atmosphere. Newlyn School of Art is based in the famous artists' colony of Newlyn in West Cornwall and provides inspiring art courses in painting, drawing, sculpture, pottery and printmaking taught by many of the best known artists working in Cornwall today. Specialising in Rock Climbing and Navigation for all skills level. The Experienced tutors can take groups of people or individuals to Cornwall's most dramatic coast line and atmospheric west Cornwall moor. Compass West is a small family run climbing school run by father and son Rowland and Mark Edwards, both of which are well qualified and experienced mountaineers and rock climbers dedicated to providing adventure and skills training. 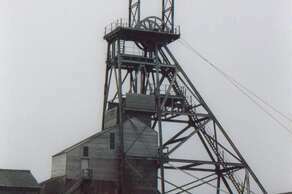 Geevor Tin mine is now a museum and heritage centre. It was a working mine from between 1911 and 1990 producing almost 50,000 tons of black Tin. It is now the largest preserved site in England with its museum covering over 67 acres. The isles of Scilly has been inhabited since the Stone Age and is a place worth visiting. It is likely that until relatively recent times the islands were much larger and perhaps joined together into one island named Ennor. The rising sea levels flooded the central plain around 400–500 CE, forming the current islands. There were ten islands in Roman times, but some of these, including Tean, are now under the sea. Distance 37 miles (59.54 km) By Boat or Plane. Goonhilly satellite station is located on the lizard peninsula, Where it has its Visitors centre. It is famous for many things and was where the first ever transatlantic satellite TV images where received on 11th July 1962. The Jubilee Pool is Britain's largest surviving seawater lido. It was opened in 1935 to mark the silver Jubilee of George V and is one of the few remaining 1930s lidos left in the country. Lizard Lighthouse is Cornwall's most southerly land lighthouse. This real Lighthouse has been shining light for over 260 years, guiding ships safely home. The amazing journey to the top will bring you up close with the lens and the breathtaking views. Morab Garden has over three acres of subtropical garden stretching from the centre of town to only a few hundred meters from the seafront. The gardens contain many exotic plants, rarely seen in other parts of Britain, Ranging from various palms, tree ferns, banana plants and even the Japanese bitter-Orange. The gardens also include a bandstand, a fountain and the Boer War memorial. Opened in 1998, Porthcurno Telegraph Museum is in a small coastal village and was the point at which many submarine telegraph cables came ashore from transatlantic and to other locations in the late 19th &20th century. At which time would have made it perhaps one of the most important communications nexus in the world. Opened in November 1912, the Savoy is one the oldest continuous running cinema in the UK. To complete your countryside experience, why not take a trip out to Trevaskis Farm, whether it's a family day out to see the farm animals or a wander around the orchards to pick your own, there is plenty to see and do. They have a restaurant on site and you can also visit their award-winning farm shop. They are normally Open from 8am daily and it is free to visit. This fantastic island with its medieval pathway is steeped in history with some of the oldest buildings dating back to the 12th century. 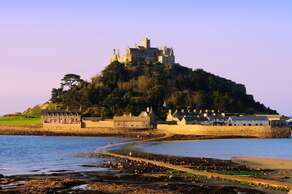 By the time of the Norman conquest in 1066, St Michael's Mount had come into the possession of the monks of its sister Isle, Mont St Michel in Normandy. In the 12th century it was their hands that built the church and priory that still lie at the heart of the castle. The original priory church was rebuilt in the 14th century where it remains in use today after it was destroyed by an earthquake in 1275. Following the English Civil War, the island was acquired by the St Aubyn family in 1659 who went into partnership with the National Trust in 1954, when the castle and its grounds were opened to the public. 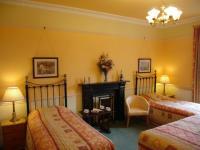 There are some fascinating rooms to see from different eras, including the mid-18th century Gothic style blue drawing room and the views are fantastic. 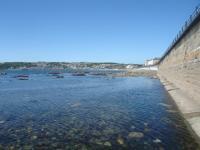 The island is accessible on foot at low tide via its medieval pathway or by boat at high tide. There are also boat trips that run to and from the Mount throughout the day so there is no need to worry about getting stranded. This Celtic settlement was originally occupied almost 2,000 years ago. The village consisted of eight stone-walled homesteads, known as courtyard houses, which are only found on the Lands End peninsula and the Isles of Scilly. 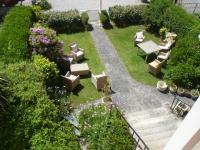 Each house had an open central courtyard surrounded by a number of thatched rooms. The houses form one of the oldest village streets in the country. The Bude &North Cornwall Golf Club is surrounded by the town and the sea and is one of the finest links golf courses in the West Country. The natural all weather fairways and greens are rarely unplayable. The greens have beautiful quick surfaces with both severe and subtle borrows. The clubhouse offers a comfortable and friendly bar and restaurant with an excellent choice of food and drinks. 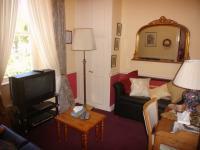 Situated approximately nine miles west of Penzance, it is the most westerly point of the English mainland. The Breathtaking views from here really allow you to appreciate the scale and beauty of the Atlantic Ocean stretching out beyond the horizon. The granite cliffs that make up the coastline of West Cornwall, are seen at their best here where the combinations of the Alantic Ocean and the strength of the cliffs, reduce us to just a mere spectator of nature. On a clear day the Isles of Scilly can be seen lying just on that horizon. 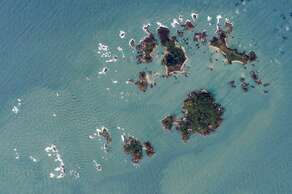 This is a small group of beautiful islands of which only five are inhabited while the remainder of nearly 100 are given over to the sea birds. Close to shore lies the Longships Lighthouse, Located just over a mile out to sea and in the distance about six miles to the south west is the Wolf Rock lighthouse. Discover a garden where the spirit of the Plant Hunters, live on in breathtaking spring displays of magnolias, rhododendrons and camellias. The walled kitchen garden will inspire creativity with your own growing space and wide open views across Mount’s Bay will have you reaching for your camera. Lose yourself among the winding, wooded paths, picnic by the stream or simply find a quiet corner to breathe in the peace of this special place. 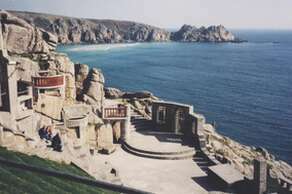 The Minack Theatre is the most famous Cliffside open air theatre in Britain and has been listed as one of the world's most spectacular theatres, it has been beautifully constructed just above a gully where its rocky granite outcrop juts out overlooking the Atlantic Ocean. 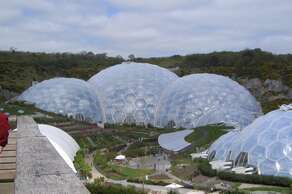 The Eden Project is a visitors attraction centre with a fantastic arrangement of cutting-edge artificial biomes and gardens which house thousands of plant species from around the world. The biomes include the world's largest rainforest in captivity with steamy jungles and waterfalls there's also the Mediterranean Biome and plenty more including the educational centre, restaurants and cafes, event gigs , concerts and even an ice rink in the winter. 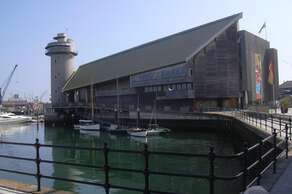 The multiple award winning harbour side national maritime museum celebrates the sea, Boats and Cornwall for those interested in maritime History its has a broad range of thing to see and do. The seal sanctuary was started in the winter of 1958 when a baby seal was washed up on a beach in St Agnes. The sanctuary has since then moved to gweek ,Were it has built up in size with the increasing number of seal's it has rescued from around the Cornish coast. The sanctuary has a wide variety of different pools and Seals including the Californian and Patagonian Sea lions. Pendennis Castle was built between 1539 to 1545 when England was faced with a possible invasion. To defend against this. A national programme of military and naval preparations was implemented by Henry VIII, Including new castles and coastal artillery forts equipped with guns to shatter any enemy warships or troop transports attempting to capture an English port. Mousehole is one of Cornwall's most picturesque hamlets. 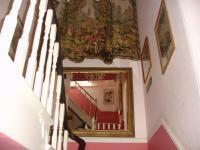 It was developed around its harbour and fishing fleet and has retained most of its original character and charm. 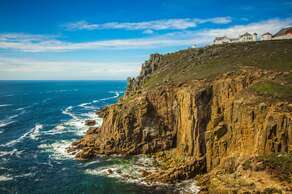 It has a stunning collection of yellow-lichened houses, built from the local finely grained Lamorna granite and has appeared in record books dating back as early as 1266. The Tate is an art gallery in St Ives, exhibiting work by modern British artists. The Tate also manages another, earlier, property in St Ives, the Barbara Hepworth Museum and Sculpture Garden which was opened in 1980. 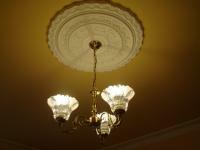 Built in 1865 as a gracious Victorian home. 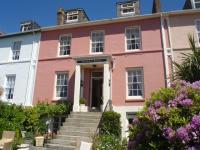 Penlee house has since been converted into the first class gallery and museum it is now, set within an attractive park. It is the only Cornish public gallery specialising in the historic art of west Cornwall, Including the world famous Newly School artists (1880-1930) such as Stanhope and Elizabeth Forbes, Walter Langley, Frank Bramley and Harold Harvey, Together with the work of their St Ives Contemporaries. The permanent collection of paintings is made up from around 750 pictures, Including works on long-term loan from the newlyn art gallery and private collectors. Spread across two venues newlyn gallery has a wide and varied programme Showcasing the very best of national and international contemporary art, as well as work by some of the best artists currently working in the region.